Chocolate sugar cookies sandwiched together with Strawberry Milkshake filling and rolled in pretty sprinkles – what more could you want?! 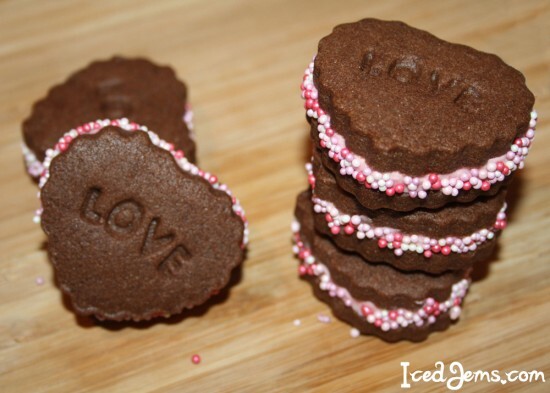 This is a very simple recipe to follow, but it makes the most beautiful cookies that would be perfect for Valentine’s Day or even as Wedding Favours. I used the cute Heart Plunger Cutter from my shop for these, along with the Strawberry Milkshake Icing Sugar and Romance Sprinkles. Start by making your no-spread chocolate sugar cookie dough! Cream together the Sugar and Butter in a large bowl, then add the 1/2 egg and mix in until well combined. 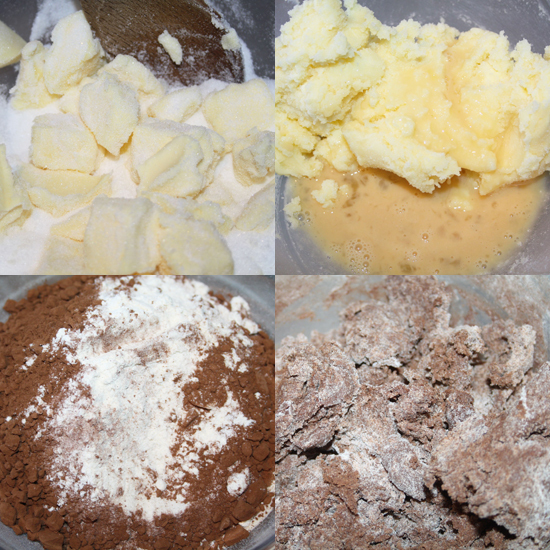 Sift in your Plain Flour and Cocoa Powder a little at a time, mixing until you get a thick dough that comes together in a ball. Wrap your dough in cling film and transfer to the fridge for about 40 minutes so that it becomes nice and firm. Once the dough is cooled, you can preheat your oven to about 160 degrees and line two baking trays with baking paper. 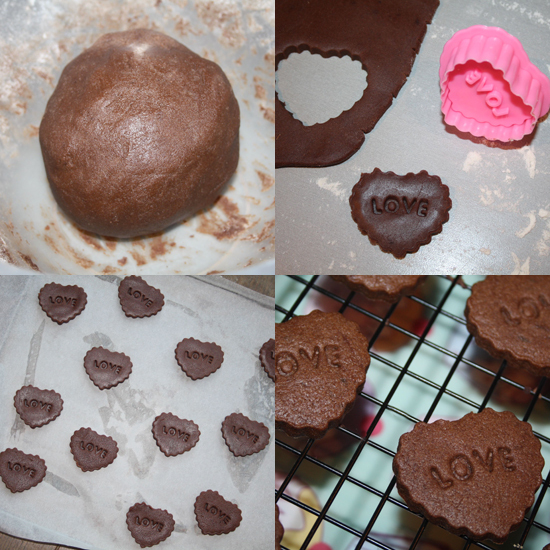 Roll out your cookie dough to approx 1/2cm thickness on a lightly floured surface, then cut out heart shapes using your plunger cutter. 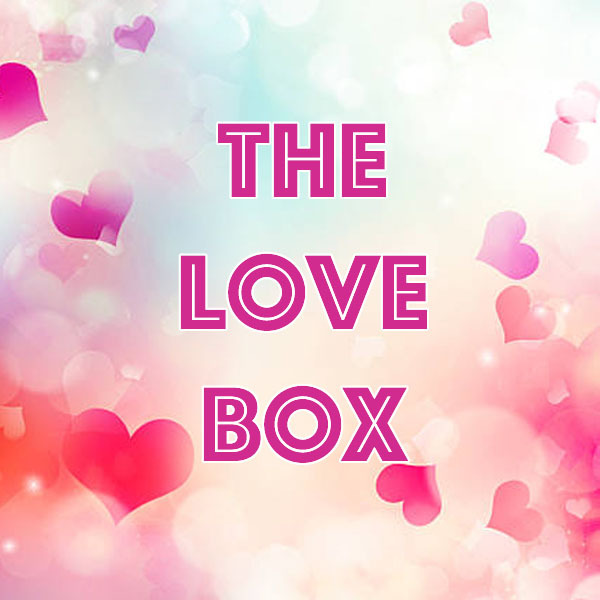 Make sure to press the plunger down to imprint the “Love” message on the cookies. 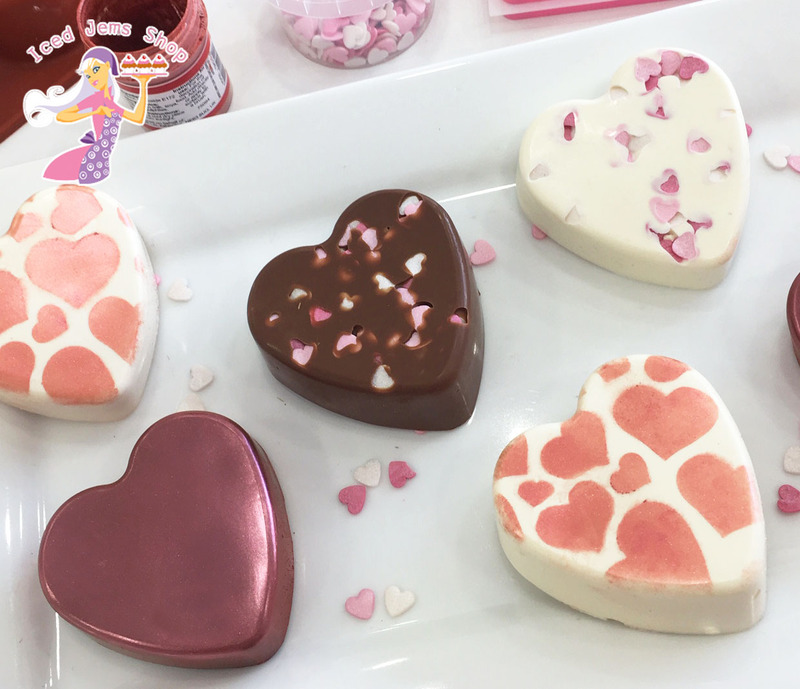 Transfer the hearts to your lined baking trays and bake for about 8-10 minutes. The cookies may still feel ever so slightly soft when you remove them from the oven, but they will harden as soon as they have cooled. 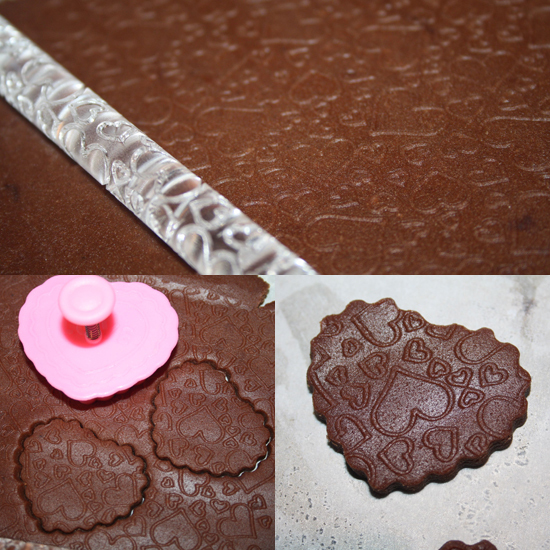 Here’s another simple idea you could try – Heart Embossed Cookies! I used the cute Hearts Pattern Rolling Pin from my shop to emboss tiny hearts over the cookie dough, then cut out Heart Shapes using the plunger and baked as above. The Strawberry filling is every bit as delicious as you would imagine. Simply mix together your Icing Sugar, Strawberry Flavouring and Butter until you get a thick paste like consistency. Add a few drops of pink food paste and mix well until you have a pastel pink colour. Now simply transfer to a disposable piping bag and snip off the end leaving you ready to pipe. 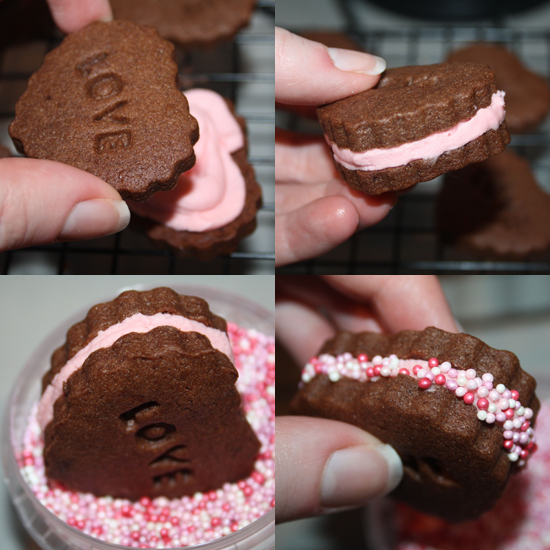 Pipe a thick layer of strawberry filling onto the back of one of your cookies making sure you cover the whole cookie. Grab a second cookie and sandwich this onto of the other, pushing down firmly and spreading the filling right up to the edges. Now dip your cookie sandwich into your sprinkles, turning it round so that all outer edges of filling are dipped in and your wonderful cookies are finished! 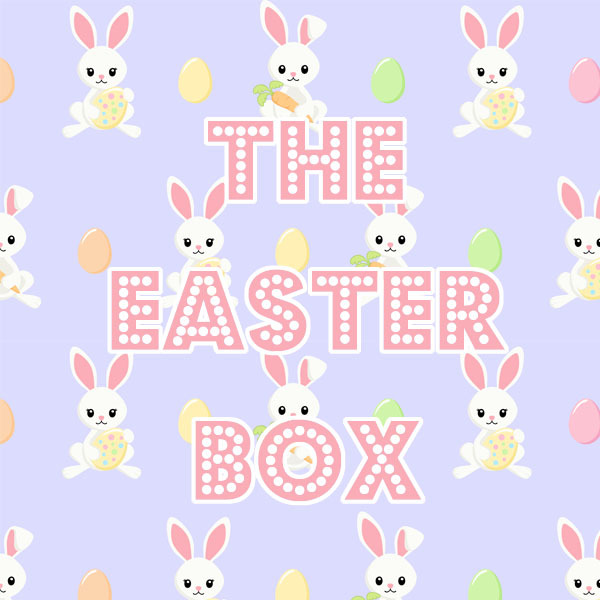 When you are not eating these, be sure to store them in a cookie tin or plastic airtight container to keep them fresh. 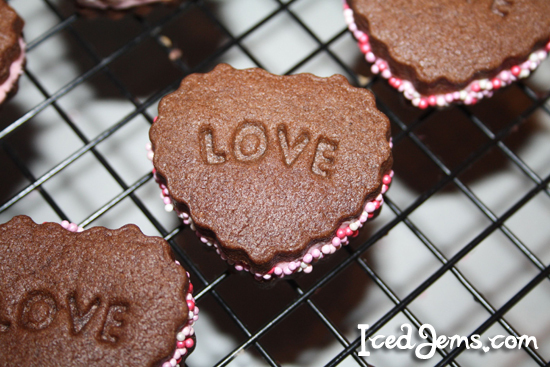 These would be fab in little cookies boxes as gifts or as part of a Valentine’s Hamper! Jem I love how you’ve coated the edges of the icing in hundreds and thousands – looks amazing and seems pretty straightforward. One for me to try at home!